Bowflex integrates Bluetooth® connectivity to connect you to your personal data, workout stats, virtual coaches, training buddies - even running tracks around the world. Bowflex is a proud partner with RunSocial, the ultimate mixed reality app allowing you to run around the world from the comfort of your living room! Travel along the sun-drenched beaches of Venice, tour the rustic beauty of Tibet, enjoy the lush Ireland countryside and more! Enjoy from your phone, tablet, or Virtual Reality headset for the ultimate immersive experience. Do it together live, anytime and anywhere! Download the FREE* RunSocial app, available for iOS and Android. Enjoy numerous real-world maps in stunning Hi Def and run solo or with your friends from anywhere on the planet. Get accurate, live tracking data from your exercise machine to your mobile device. 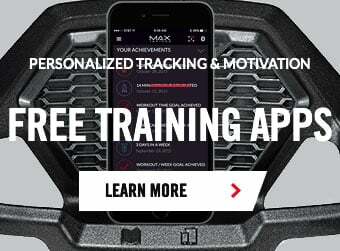 Maximize every workout with personalized coaching, tracking, motivation & more! *RunSocial app also offers in-app purchases.